grandes espacios y patios, ideal para relajarse o entretener a los invitados piscina comunitaria con vistas al hermoso puerto deportivo. Pista de tenis también disponibles. Caminar a la pesca deportiva, Restraunts y bares. Ubicación central a minutos de las playas y la zona dorada (zona turística original con muchos hoteles, bares y restaurantes) .También junto al campo de golf nuevo centro de convenciones y el centro comercial más nuevo de Mazatlán. Convienient bus o en taxi al mercado central y Mazatlán edad. Estuvimos muy comodos y muy contentos en nuestra estancia en Mazatlan, la casa muy biem, muy comoda y los anfitriones muy atentos y serviciales. Very nice place. We loved sitting out on the patio watching the fish jump & seeing all the birds. Central location, easy to get transportation anywhere. Friendly guards & maintenance staff. Neighbors are helpful. Beautiful house with large spacious rooms.Robert & Karla were very accommodating. We would definitely rent again. The house is huge and fairly well located. Reasonably clean, quiet and safe. Having said that, the home is in need of a lot of deferred maintenance e.g. dishwasher doesn't work, many of the vertical blinds are missing slats, baseboards missing or broken, furniture damaged or broken, needs painting, very few kitchen supplies (e.g. soap, cleaning supplies, bags) very large garage takes up much of the advertised 2,000 ft main level, flat screen TV is very small, no English channels to speak of, foul odour in maintenance room, just an overall feeling of neglect. There is air conditioning and good internet. Karla was available by phone to help out with emergencies when she could. Gated community with swimming pool and tennis court. We were two couple in our 60's. Two of us would return two of us wouldn't. Great deal for the amount of space but it is not of 'mansion' quality. I have been using Home Away for many years now and have never encountered a problem like this. I rented this property for my sisters, baby nephew, and I for our stay in Mazatlan from October 5-11, 2017. Arrived dropped our things off and at first glance things looked okay. Went shopping for some food items and when we got back started to put food away. Noticed some little black pellets on the kitchen counter. Wiped the counters without thinking much of it other than it may have been something the cleaning lady missed since the counter tops are dark. Went out to grab dinner and explore and when we came back we started to unpack and settle in when we realized that there was rat droppings throughout the property. There was also a dirty towel left in one of the bathrooms, a hand towel with toothpaste on it, and the sheets on one of the beds had hair. We laundered all of the linens and decided to try to figure out where we could stay since we were unwilling to stay at this place under these conditions. Called and spoke with Karla and explained the situation. She seemed surprised and apologized for what we encountered. I asked her about getting a refund and she said she would have to speak to HomeAway to see what their policy is. Found a place where we could stay for the rest of our time there and per her instructions left the key and remote with the guard. I sent her pictures of what we had encountered. She acknowledged receipt and that was it. Didn't hear from her again. I messaged her two days later and got no response. She finally messaged me on the 11th saying that she was still waiting for word from HomeAway. I had gone on the website and it stated that the property owner had the ability to refund me. I explained that to her and we are now on October 23rd and I have not heard anything from Karla. I went through the proper channels to resolve this amicably with her because I tried to be understanding of the fact that she is out of state. Called HomeAway and they said that she hasn't responded to their communication either. They claim that they cannot do anything and that I should try to go through my credit card company to dispute. Karla, I'm very sad that you did not make an effort to make things right. I wouldn't recommend anyone rent this property. Other things not working: refrigerator doesn't cool, dishwasher doesn't work, AC doesn't work in a room, and there is a gas smell in kitchen. Would like to begin by saying this home is not for everyone. 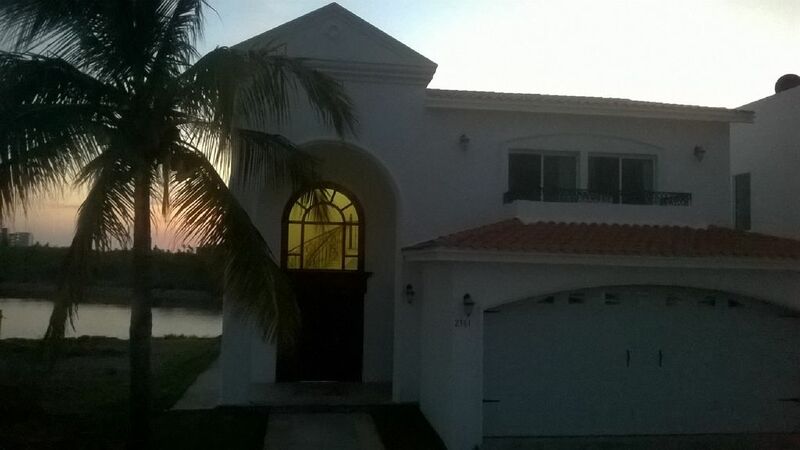 When we took on the task of purchasing one of the few available canal front lots in Mazatlán and built a 400sf .4 bed ,4 bath home with 7 tons of A/C. It wasn't our intention to enter hotel business. We do not wish to compete with the many fine hotels and condos around town. We just share our house at a reasonable fee to offset some of the costs associated with ownership. We have a maid clean after all guests leave and again before arrival of all new guests. There are no daily cleanings included in rental fee. Unfortunately since we live in Texas we cant be there to supervise cleaning. When this guest called 2 days into her stay my wife told her we'd send a maid in the morning to clean entire house again. This guest stated that they had brought a small baby and were unwilling to stay. Would agree considering the presence of a small child that this guest made a poor choice in choosing one of the only canal front homes in Mazatlán It is very clear from our description and there's even a map that shows our home is the only canal front home for rent. This makes our home very appealing to our mature guests who often enjoy watching boat traffic go past house. But makes this property very dangerous for a small child since there is no beach no fence and if child is drawn to water and falls in it drops off! As for False claims of rodent problems . We can only assume that the droppings observed would have been from one of the many Gecko's that live in and around our home and many others in this tropical climate. You also occasionally have equines sunning themselves in yard. If you were looking for a reason not to rent our home this guest has given you many. As I've said there are many fine properties to rent around town. Words are very powerful and as this guest stated if you really need your $692 you can make any claims you wish and it will be the burden of the other party to disprove claims. We chose not to and this guest received her full refund from American Express. Thank You for your Interest in our Home Robert and Karla. ubicación ideal justo en el corazón de la Marina Mazatlán. Cerca de nuevo centro de convenciones, centro comercial, campo de golf. A pie de restaurantes, discotecas y de pesca deportiva de la flota. Taxi corto o en autobús 2-3 kilómetros hasta la zona dorada originales (Región) con más hoteles y restaurantes. El viaje en taxi o autobús al centro de Mazatlán, Mercado Público, Plaza Machado, terminal de cruceros, el acuario, el estadio de béisbol, etc. 10-15 minutos Idealmente localizadas en el Corazón de la Marina Mazatlán. Muy cerca del Nuevo Centro de Convenciones, del centro comercial, Campos de Golf. Cortísimas Distancias un Restaurantes, Clubes Nocturnos y Flotas de Pesca de la Zona. En Taxi y / o Autobus this un 2-3 kilometros de distancia La Famosa Zona Dorada (Zona Turistaca) con mas Hoteles y Restaurantes. Minutos De10-15 esta el Acuario, el Estadio de Beisbol, el Centro de la Ciudad, El Mercado, La Famosa Plazuela Machado, la terminal de los Cruceros, etc.